Famed Umbrian winemaker Paolo Bea's son Giampiero and winemaker Gaetano Gargano have partnered to produce this unusual and intriguing Sicilian project. Sicily has long been an important player in overall Italian wine production, though namely bulk wine and Marsala. In recent years, there's been a growing interest in the island by serious winemakers, including these two dudes, and badass winemaker and voice for biodynamic viticulture, Arianna Occhipinti. The island has a varied terrain and microclimates; it's hot and dry in the middle, richly volcanic soils and high elevations on Mount Etna, and coastal influences along - you guessed it - the coast. Sicily is also unique in that it boasts a long list of indigenous grape varieties, including reds nero d'avola and frappato, and whites inzolia, grillo and catarratto. Il Censo "Praruar" is made from 100% catarratto grapes. The color in the photo is pretty damn close to the actual color of the wine, officially considered an orange wine. Perhaps you've heard or read about the new orange wine craze? Not so new, actually, like most trendy wine discoveries - pet-nat, Jura, natural wine - it's been around for centuries. Orange wine is simply a white wine fermented on its skins. Typically white wine is made by separating the juice from the skins after pressing the grapes. Red wine, on the other hand, ferments with the fruit anywhere between a week to 21 days, extracting color, tannin, flavor and other phenolics. 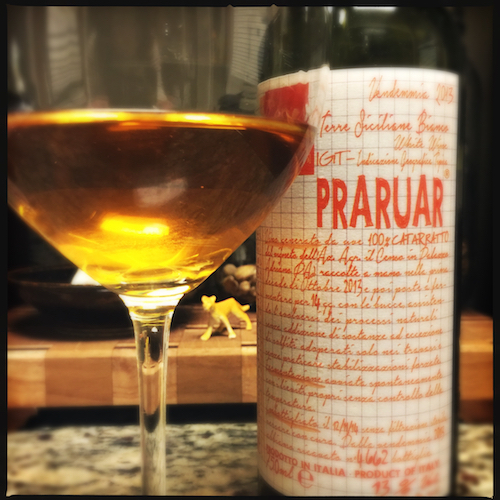 In the case with the Praruar, a hint of oxidation adds to the color, and the interest. It was a challenge to find technical information about this wine, even where exactly it's from. It's bottled, and presumably made, in Palazzo Adriano in the wine region of Palermo. I'm wondering if they didn't buy fruit from growers in and around that region, but I can't find confirmation of that. The wine is an IGT Terre Siciliane, which is the most generous of quality wine designations. From what I can gather, the grapes were hand-harvested and the fermentation begun naturally with native yeasts, without the use of sulphur (except at bottling for safe keeping as it travels halfway around the globe) then left alone to do its thing. Can't confirm what it was fermented in - my guess would be old barrels, possibly large, cement tank or amphorae, though I doubt the latter. You see why this wine is so interesting? It's a freaking mystery! It's also fun to drink, interesting but not so austere as to turn off most drinkers. Baked apricot, orange peel, herbal notes and some nuttiness on the nose, followed by dried citrus and salty notes, with some oxidation. More grip than typical whites, good acidity and a long flavorful finish. Pair with roasted fish and vegetables, goat cheese, or as an aperitif. Don't drink it too cold, or you'll miss the nuance. If you know this wine better than I and have the 411 on the particulars, please shoot me an email. Much appreciated!